When it comes to elite sports, the game is just as much mental as it is physical. Yes, skill and fitness play a huge part, but the winning is done in the heads of the players. Nowhere is this more apparent than at a World Cup where the pressure can be crushing. Games are won and lost on a moment of brilliance or coolness under pressure… and a brain explosion can be fatal. As an All Blacks fan watching the world cup, I’ve been taking careful note of what the players and management alike have been saying in the media. Surprisingly enough, I have noticed a remarkable similarity between the mental strategies of the All Blacks and those of top traders. Let’s take a look at some now. Steve Hansen, the All Blacks coach, consistently talked about getting clear at the start of the week on what the team and individual players would be doing in the game the following weekend. Once they were clear on what to do, they would shift into a phase of mental preparation so they could reach the game in a peak mental state. This is the same for the trader. If you are confused or unclear, then you will likely make mistakes and find it hard to get to any sort of peak trading state. Mastery of objectives is critical – I cannot state this strongly enough. All Black first five and Test rugby’s all-time top points scorer Dan Carter credits the mindset of not thinking about the result, but rather nailing the task at hand, as being very helpful to his performance. “It’s easy to start thinking about the result and what potentially could happen and you soon lose track of [what you need to do right now]”. Star midfielder Sonny Bill Williams backs this idea up. For the trader, a focus on the future takes away our ability to respond to what is happening right now in the market. Better to focus on completing the current task as best you can, without worrying about what the market will do. It’s about the process, and being experienced at doing it over and over again. After the All Blacks’ nail-biting victory over their old rival the Springboks (South Africa) in the World Cup semi-final, coach Steve Hansen credited experience in executing the right processes as one of the keys to the victory. The All Blacks have a win rate of close to 90% in the last few years – with the majority of those games being against world class opposition. A lot of those games have been very close. Winning tight games is achieved through staying calm, focusing on the essential processes and having a core group of players who have been there and done that time after time. For traders, the necessary confidence and composure to perform when it matters most is going to come from a relentless focus on executing your processes again and again under pressure. In the semi-final with South Africa, the All Blacks were behind on the scoreboard at half time by five points and had a man in the sin bin. The message was not to pull out some fancy moves. It was simply to eliminate mistakes and improve the discipline. For traders, this approach should ring true. Effective trading is not about the latest technique. It’s about cutting out errors and remaining disciplined. These are the things that are going to turn you into a long-term winner. It’s mastering the mental strategies of peak performance that will give you the success that you so desperately want in the markets. Get extremely clear on what you want to do at the start of the week? Trade in the moment, and execute the task in front of you with your full attention? Become highly experienced at executing your processes under pressure? Exercise discipline and eliminate mistakes from your trading? If you want to learn more, there is a lesson in the Advanced Forex Course for Smart Traders on how to get in the trading zone like an elite athlete preparing before an event (get free access). 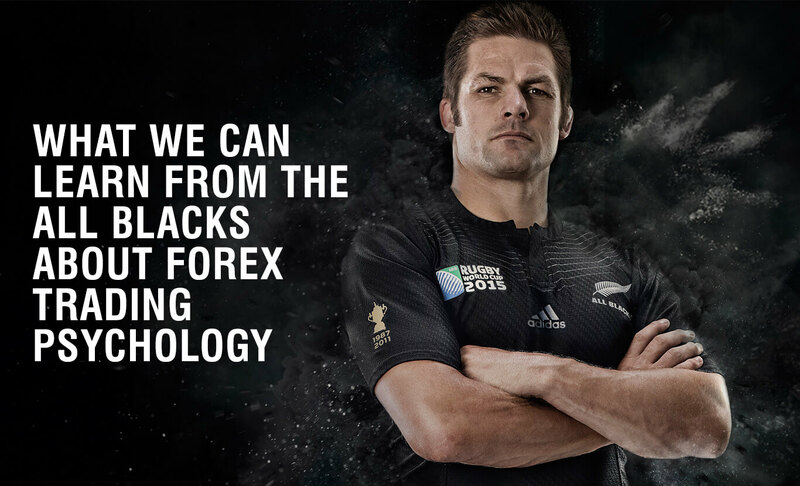 The post What We Can Learn From the All Blacks About Forex Trading Psychology appeared first on www.forextell.com.